Ventricular fibrillation (VF) is incompatible with life. It represents rapid chaotic depolarisation of the ventricle at very high rates and does not produce a meaningful cardiac output. The only advised treatment is rapid electrical cardioversion with appropriate CPR to maintain cerebral perfusion during resuscitation. Ventricular tachycardia (VT) is a life-threatening arrhythmia. If represents depolarisation initiated within the ventricle through a re-entry circuit, usually formed around ischaemic or scarred myocardium. It can reach rapid rates and causes the heart to contract abnormally, producing hypotension or syncope. It can also produce cardiac arrest. Infrequently, however, it can prove asymptomatic – an important point to remember when faced with an ECG like the one above and an apparently well patient. There are many tips and tricks available which help to distinguish VT on an ECG from an atrial rhythm with bundle branch block. The easiest to remember doesn’t require you to even look at the ECG. 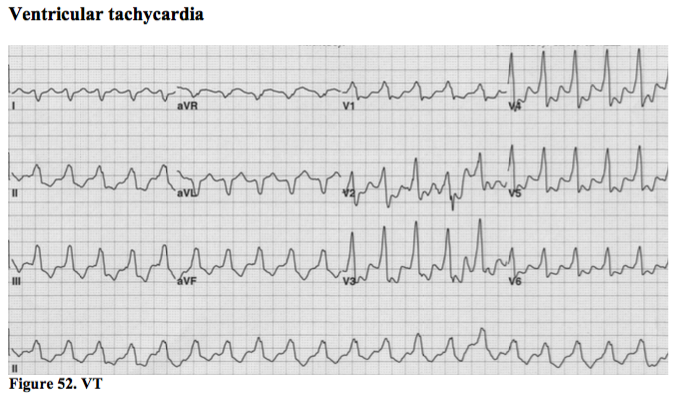 A broad-complex regular tachycardia in someone with a history of prior myocardial infarction is more than 90% likely to be VT. You are advised to treat these subjects as though they have VT whatever you may think of their clinical condition or their ECG. If you are wrong, you are very unlikely to do harm. If you incorrectly treat a patient with VT as though they are SVT (e.g. with B-Blockers or Verapamil) you could seriously harm the patient. The first ECG pointer to VT is a simple one, but does require a bit of experience to apply. If the ECG looks odd – it simply looks abnormal - it is more likely to be VT. To put it more scientifically, unusual looking ECGs are more likely to arise from parts of the heart that do not usually initiate conduction – such as areas of scarred myocardium that may initiate VT. The second pointer, is the presence of concordance on the ECG. A normal ECG shows a standard progression of the QRS across the limb leads. 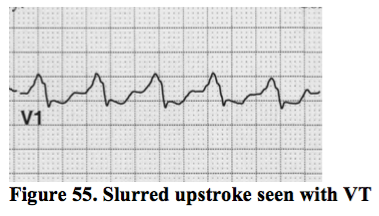 Even in RBBB, there is a characteristic progression from an upright QRS in V1 to a downwards QRS in V6. 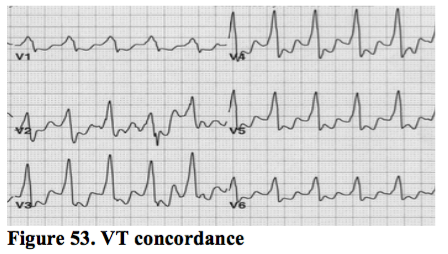 Shown below is an example of VT to illustrate how chest lead concordance is a pointer to a diagnosis of VT.
All QRS complexes point in the same direction – upright. This is typical of a rhythm originating from far outside of the bundle branches – i.e. in the ventricle itself. The presence of an accessory pathway can invalidate this rule, but otherwise this sign can prove useful. Third, is the establishment of independent p waves within the ECG. Sometimes you will have to search all leads in order to spot this. Distinguishing minor variations in individual QRS can be hazardous due to baseline variation from artefact. In this example, however, a p wave can be seen in the T wave of the third QRS, which is not present in QRS 1, 2 and 4. The remainder are buried within the QRS complexes. Fourth, capture beats may be apparent on a 12-lead. This is where a normal QRS breaks through between VT beats. Fusion beats may also be seen, which represent a VT beat combining with the underlying sinus beat to produce a single, bizarre QRS. These four are the most useful methods in our view. There are others documented in the literature which are of varying usefulness and are occasionally misleading. These include the character of the upstroke of the QRS in lead V1. If there is a gradual onset of depolarisation, a slurred upstroke to the QRS, this makes it more likely to be VT. Here were see the slurred upstroke of the QRS from the ECG showing VT on the previous page. Similarly, if the tachycardia is LBBB in morphology, VT is the likely diagnosis if the time from the beginning of the QRS in V1 to the bottom of the S wave is greater than 70 ms – i.e. a slurred initial downstroke. The breadth of the QRS has also been shown to assist in differentiating between VT and SVT. If a RBBB morphology tachycardia has a QRS>140ms or a LBBB morphology tachycardia has a QRS>160ms, this may point towards VT and away from SVT with bundle branch block. Extreme axis points to VT. If LBBB is present with right axis deviation, this is likely to be VT. There are several other more complex rules, but we will not cover these here for purposes of clarity. Each of these rules are somewhat evidence-based and form a series of clues, rather than each being hard and fast in isolation. It is important to keep an open mind about any patient who does not obey them, as not treating as VT on the basis of abstract rules can endanger the patient. For all of the rules quoted above, an instructional anecdote was recently heard by the authors. At a previous meeting of consultant cardiac rhythm specialists (the biggest in the world), a world-renowned expert on VT showed an ECG of a broad complex tachycardia. Many of the leading experts in the study of VT in the world were in the audience. When the speaker asked for a show of hands on whether the ECG showed VT, or SVT with aberrancy, 50% of the audience voted for each. 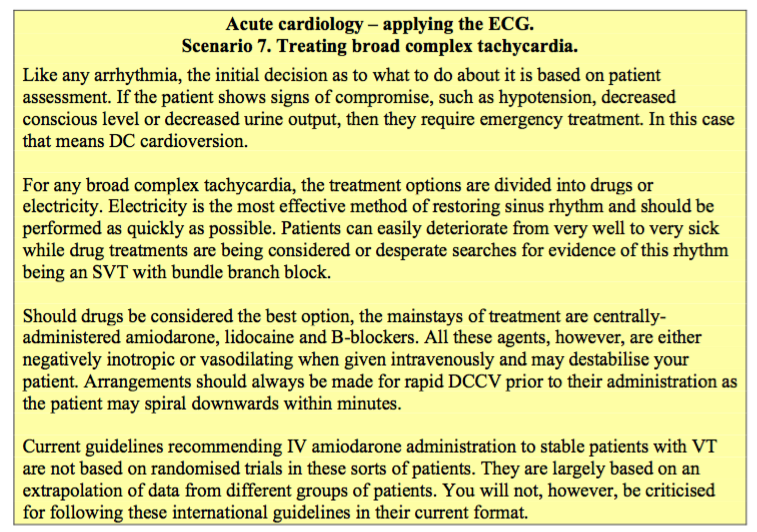 Therefore, whilst these rules help with some ECGs, there are others where it is just impossible to be sure.